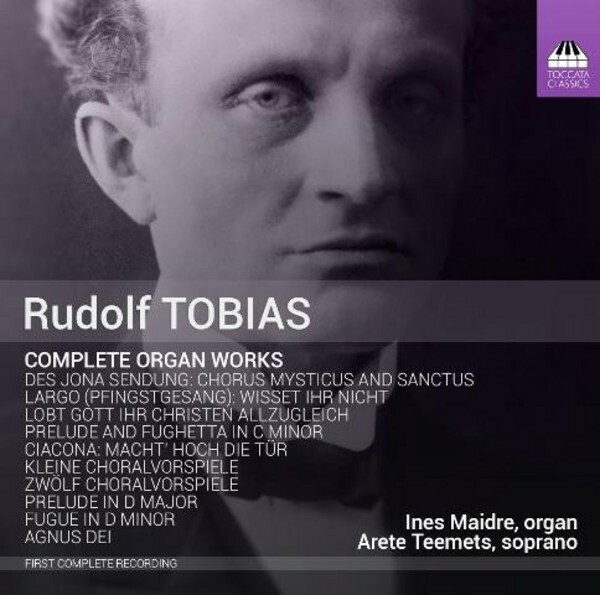 Rudolf Tobias (1873-1918) is far and away the most important Estonian composer of the late Romantic period. He founded the classical-music tradition in Estonia almost single-handedly, writing the first Estonian orchestral piece,the first Estonian string quartet, the first Estonian piano sonata, the first Estonian piano concerto and the first Estonian oratorio - the monumental 'Des Jona Sendung' (�The Mission of Jonah�). From that work, Ines Maidre has now transcribed for organ the blazingly powerful Sanctus. Although Tobias was trained as an organist, most of the music he wrote for his own instrument is modest in scale and quantity, but its quirky craftmanship reveals the hand of a master. This is the first recording of the complete Tobias organ music. Estonian organist Ines Maidre has taught the organ at the Estonian Music Academy and is now associate professor of organ at the Grieg Academy. Played on the Sauer Organ of Tallinn Dome Church.